Get your officially licensed Arizona Cardinals NFL dog jersey for you favorite pup to show his or he.. 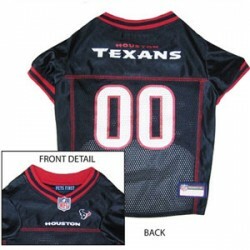 Your favorite pup will look great while representing your favorite team in an officially licensed NF.. Does your dog need an officially licensed Buffalo Bills NFL dog jersey? This dog jersey is mad.. Your dog will be proud to show off his or her Carolina Panthers officially licensed NFL dog jersey! ..
Don't leave your favorite pups out when watching your favorite NFL teams play. Get them an..
Won't your dog look smashing in his or her Cincinatti Bengals gfficially licensed NFL dog jersey.. This officially licensed Cleveland Browns NFL dog jersey is made of 100% satin and poly mesh jersey ..
Now the wholse faminly inluding that special pooch can root for the home team in this officially lic..
With this officially licensed Detroit Lions NFL dog jersey even the family pet can now show their su.. Your dog will feel like he has scored a touchdown in this officially licensed Green Bay Packers NFL ..
Go Team! Let your fur-baby support his or her favorite team in this officially licensed NFL Houst..
Show your pup's team spirit in this officially licensed NFL dog jersey! This dog jersey is made ..
Let your doggy share in the excitement this season in this officially licensed NFL dog jersey! This ..
Help your dog join the fun with this officially licensed NFL dog jersey! This dog jersey is made of ..
Go Team in this officially licensed NFL dog jersey! This dog jersey is made of 100% satin and poly m..
Help your pup join in the fun with an officially licensed NFL dog jersey! This dog jersey is made of..